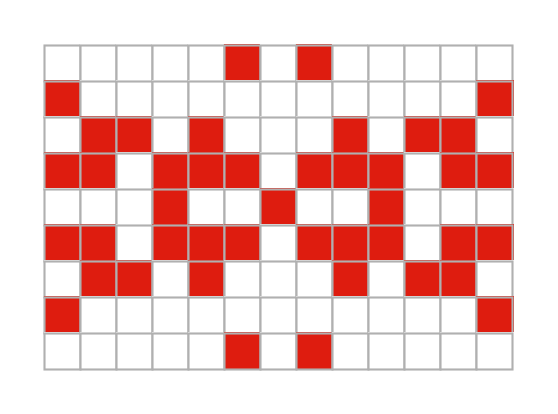 I’ve been meaning to show how some of my secret code grids look when worked up as other crafts. This month I dug out my extremely rusty cross stitch skills and worked samples until I found one I wasn’t embarrassed to show the world. I think it gets the idea across, though! In case you’re new to my blog posts, I’ve come up with several ways of embedding encoded words in charts for use in charts for fibers arts. My subscribers on Patreon suggest a word for me to work on each month and then I work up the chart and some examples. I hope you enjoy it! I used a different Embers chart to make a knitted lace version. Embers stitch patterns by Naomi Parkhurst are licensed under a Creative Commons Attribution 4.0 International License.